Dental caries is a bacterial infection affecting retentive areas of the teeth. It has shown significant increase in incidence and prevalence in modern population. Extensive studies have been performed on etiologic aspects of dental caries, trying to investigate the possible causative and preventive factors such as various salivary components, including immunoglobulins and enzymes, vitamin C, calcium, and salivary pH. During the past decades, various theories have been postulated in an attempt to explain the etiopathogenesis of dental caries. Miller’s Chemicoparasitic Theory (1882), Gottleib’s Proteolytic Theory (1948), and Schatz’s Proteolytic Chelation Theory (1955) are among the most widely accepted theories that have essentially remained unchanged over time. In spite of detailed etiopathogenesis suggested by various researchers, there is no cure and the carious process cannot be reversed in a way other bacterial infections are treated through antibiotics. Focus has finally been shifted toward a conservative approach. Therefore, to tackle this issue, a new approach and detection of other risk factors or indicators are needed. Miller’s Theory (1882), which is almost the backbone of our knowledge of the etiology of the dental cariology, states that dental caries is a disease of microbial origin in which the dietary carbohydrates are fermented by the oral bacteria, resulting in acid formation that causes the demineralization of the inorganic part (minerals) and disintegration of the organic part of the tooth. the phenomenon of arrested caries. However, it is still widely accepted despite its drawback. Even rampant caries has not been fully understood as far as etiopathogenesis is concerned. When these fluids are maintained within a narrow alkaline pH range of 7.35 to 7.45, our body’s immune system operates in an optimal condition and is able to fight off all diseases. On the contrary, overacidification of the body is a dangerous condition that weakens all body systems and can give rise to an internal environment conducive to disease and even death. When interstitial fluid is too acidic, body will do everything in its power to maintain an alkaline balance by absorbing minerals from hard tissues to minimize acidity and to make it alkaline. One of these minerals is calcium that is found in bones and teeth. The body pulls minerals from these hard tissues to make it alkaline. As the body’s acidity increases, more and more calcium is removed from the bones and teeth. If left unchecked over a long period of time, it can lead to osteoporosis of bone and demineralization in the teeth. Does interstitial fluid of body also become acidic in dental caries patients? Could this be an additional and initial event in the entire pathogenesis of dental caries? Does “caries-free individuals” have an alkaline internal pH? Does arrested caries occur when body shows reversal of pH, from acidic to alkaline? Can it be reversed as many other bacterial infections do? The question can be raised, how does this acidic pH affect dental caries? Hypothesis could be explained as in later subsections. Figure 1: Incipient lesion seen as white spot in self cleansing area. In addition, when incipient lesion is examined histopathologically, it shows various zones, which begin from inward to outward, in both dentin and enamel. Zones of caries in dentin starts from odontoblastic zone to dentin enamel junction (DEJ), and enamel caries starts from DEJ to surface enamel, which strongly support the hypothesis that internal or interstitial acidic pH is first most important event in the etiopathogenesis of dental caries. Therefore, dentin and bone get demineralized simultaneously because both have almost similar chemical composition. When bone is affected, dentin also has equal chances of getting affected. The perfect example of this association is a genetic disorder, that is, dentinogenesis imperfecta, associated with osteogenesis imperfecta wherein both tissues simultaneously get affected. Histopathologically, the various zones of dentin and enamel zones of incipient lesion are graded in terms of pore volume similar to osteoporosis. The special stain, modified Gallego’s stain, gives similar green color to both bone and dentin, which further proves that both tissues have same histochemical nature. The chemical composition of dentin and bone has been proved to be same, therefore interstitial fluid has to demineralize both simultaneously. The critical pH of enamel is 5.5, that is, demineralization start at this pH. However, the living organism would be almost dead at this pH if initial demineralization begins through internal pathway with this pH. So, it could be hypothesized that when the systemic pH values become slightly acidic, that is, at 7 or just below 7 (6.9) which is a critical pH of bone, the demineralization starts slowly as a chronic process from pulpal end too and radiates outward through dentinal tubules and enamel rods toward surface of tooth, to produce incipient caries or white spots. Thus bone and dentin demineralization is a simultaneous process as per hypothesis. The pH values ranging from 7.4 to 7.1 is considered normal for bone and therefore to dentin too. Once it drops to below 7, demineralization starts, which is justified by Arnett et al. in his review article. 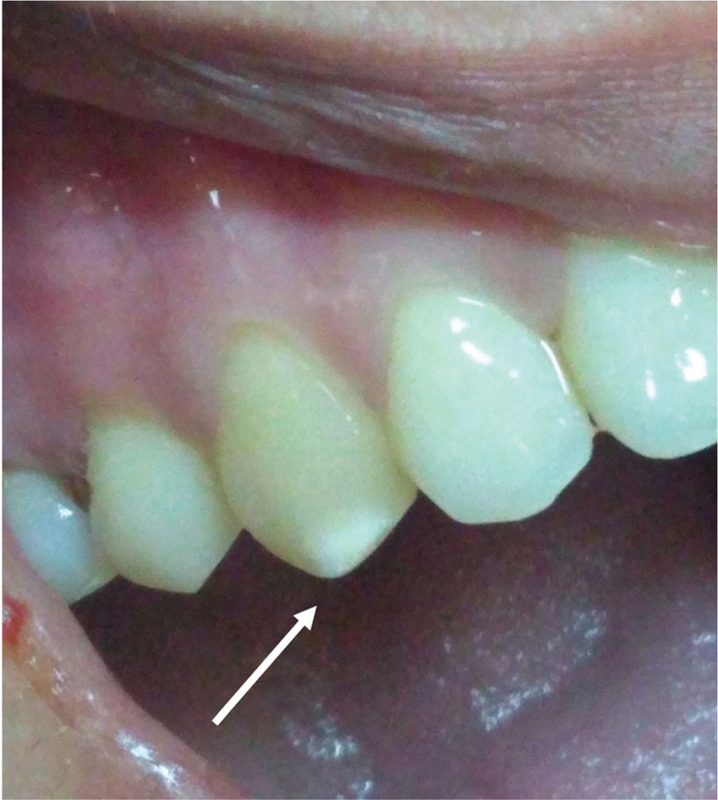 Question arises that if interstitial fluid is responsible for initial event of demineralization then it should be generalized process throughout the dentin instead of white spot areas. It could be justified that every tooth has hypocalcified areas in dentin and enamel, which are prone to dimeralization. These areas are dead tracts, interglobular dentin, tomes granular layer, enamel spindles, enamel tufts, enamel lamellae, and enamel rod sheath. The uniform flow of dental lymph first attacks these weaker areas and demineralizes, which further expands them to reach the surface to be seen as white spots. Therefore, it could also be justified that acidic interstitial fluid is also responsible for generalized nature of rampant caries as deciduous teeth are overall less mineralized and prone to demineralization at multiple areas. Disturbed sleep and nutritional deficiencies in child could be responsible for acidic interstitial pH and rampant caries. In addition, radiation caries occurring in patients undergoing radiotherapy occurs only in cervical areas, because it has been strongly proved that patients suffering from malignancies have high acidic pH. So, it could be postulated that cervical caries occurring in these patients could be due to acidic GCF caused by high dose of chemotherapy, which also causes acidic interstitial acidic pH. Matrix metalloproteinases (MMPs) such as MMP-8, MMP-2, MMP-9, MMP-3, MMP-2, MMP-14, and MMP-20 are the main MMPs that have been identified in pulp, odontoblasts, and predentine/dentine. The various possible sources of MMPs in the carious lesion are saliva, gingival crevicular fluid, and MMPs produced by the odontoblasts. 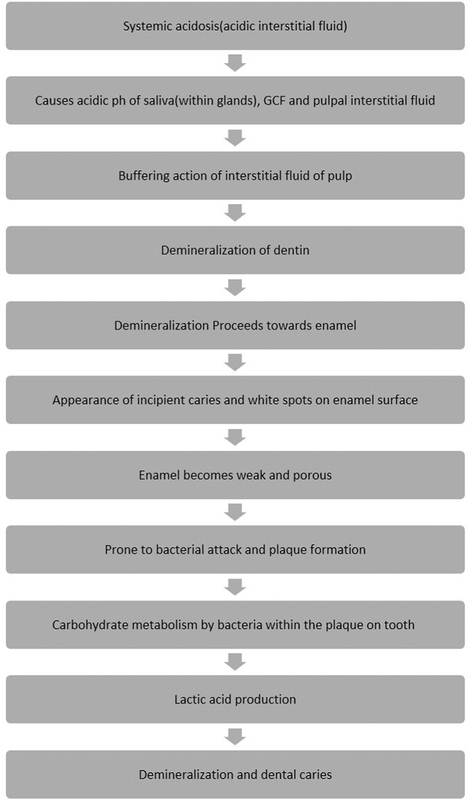 Therefore, it could be hypothesized that demineralization and degradation start from pulpal side and lead to porous dentin, which progresses to enamel. Such weaker hard tissues of teeth are then prone to microbial attack and their metabolic acids.,,,,, This hypothesis has been supported by Bäckman in a research conducted on rats, which stated that there is a reason to assume that the changes in acid–base balance have effects on dentine metabolism as they do on the bone. In humans, several congenital chronic diseases, causing acid–base disturbances, result in changes in dental health and alterations in tooth structure and development. It could be hypothesized that such carious teeth therefore might remineralize, if oral hygiene is maintained and systemic pH becomes alkaline later. In addition, caries-free individuals could have an alkaline pH permanently and therefore have highly mineralized teeth that are caries resistant. The lower the pH level of body fluids, the less oxygenated and acidic they will be. Therefore, hemoglobin estimation is also an important factor to consider in cases of systemic acidosis. Dr. Warburg was awarded the Nobel Prize for his discovery that cancer thrives in anaerobic (without oxygen), or acidic, conditions. He firmly believed that there was a direct relationship between pH and oxygen and also acidic pH and cancer. Researchers have been trying to even reverse cancer by making systemic or internal pH alkaline. Too much acidic content in the body also makes it more susceptible to bacteria, fungi, and viruses. An acidic environment is perfect for these microorganisms to thrive, which is also a feature of dental caries. Analysis of internal pH through GCF, blood, and pulp tissue is of paramount importance to assess its role in initiation and progression of dental caries and explore unanswered questions in dental literature as far as etiopathogenesis of dental caries is concerned. This could be used in arresting caries progression and its prevention in the initial stages, and invention of new treatment modalities for dental caries by alkalizing body pH. It would also create a new horizon for other systemic diseases, including cancer as it flourishes in acidic pH. Therefore, future researches should focus on evaluation of pH of dentinal fluid more specifically through nanosensors in dentin and also its progression into enamel. Shafer WG, Hine MK, Levy BM. Dental caries. In: Shafer’s textbook of oral pathology. 5th ed. Amsterdam: Elsevier 2006. Tamgadge S, Tamgadge A, Agre B. Internal Ph in health and disease. Int J Curr Res 2016;8:34315-20. Southward K. The systemic theory of dental caries. Gen Dent 2011;59:367-73; quiz 374-5. Kellum JA. Determinants of blood pH in health and disease. Crit Care 2000;4:6-14. Reshkin SJ, Cardone RA, Harguindey S. Na+-H+ exchanger, pH regulation and cancer. Recent Pat Anticancer Drug Discov 2013;8:85-99. Felicetti MJ. How to balance your pH to heal your body; 2012. http://www.mindbodygreen.com/0-6243/How-to-Balance-Your-ph-to-Heal-Your-Body.html. [Last accessed on March 15, 2015]; Abelow BJ, Holford TR, Insogna KL. Cross-cultural association between dietary animal protein and hip fracture: A hypothesis. Calcif Tissue Int 1992;50:14-8. Feng X, McDonald JM. Disorders of bone remodeling. Annu Rev Pathol 2010;6:121-45. Larmas M. Dental caries seen from the pulpal side: A non-traditional approach. J Dent Res 2003;82:253-6. Tamgadge S, Tamgadge A, Srivastava C, Satheesan E, Bhalerao S. Modified Gallego’s stain as differential stain for oral hard tissues in oral pathology: A preliminary report. Int J Oral Maxillofac Pathol 2014;5:2-6. Steinman RR, Leonora J. Relationship of fluid transport through the dentin to the incidence of dental caries. J Dent Res 1971;50:1536-43. Steinman RR. Is caries susceptibility an internal problem of the tooth?. Quintessence Int Dent Dig 1978;9:95-9. Kapoor N, Cherian KE, Pramanik BK, Govind S, Winford ME, Shetty S et al. Association between dental health and osteoporosis: A study in South Indian postmenopausal women. J Mid-life Health 2017;8:159-62. Fabiani L, Mosca G, Guanine D, Giuliani AR, Farello G, Marci MC et al. Dental caries and bone mineral density: A cross sectional study. Eur J Paediatr Dent 2006;7:67-72. Roggenkamp C. Dentinal fluid transport: Lifetime research of Ralph Steinman and John Leonora leading to a theory of hormone-axis mediated dental cariostasis. Loma Linda, CA: Loma Linda University Press of Dentistry; 2005. Print. Ganowicz E. Salivary diagnostics—Diseases of the oral cavity. Dent Med Probl 2011;48:421-30. Palosarri H, Ding Y, Larmas M, Sorsa T, Bartlett JD, Salo T et al. Regulation & interactions of MT1-MMP & MMP-20 in human odontoblasts & pulp tissue in vitro. J Dent Res 2002;81:354-9. Sulkala M, Larmas M, Sorsa T, Salo T, Tjaderhane L. The localization of matrix metalloproteinase-20 (MMP-20, enamelysin) in mature human teeth. J Dent Res 2002;81:603-7. Sulkala M, Paakkonen V, Larmas M, Salo T, Tjaderhane L. Matrix metalloproteinase-13 (MMP-13, collagenase-3) is highly expressed in human tooth pulp. Connect Tissue Res 2004;45:231-7. Sulkala M, Tervahartiala T, Sorsa T, Larmas M, Salo T, Tjaderhane L. Matrix metalloproteinase-8 (MMP-8) is the major collagenase in human dentin. Arch Oral Biol 2007;52:121-7. Mazzoni A, Pashley DH, Tay FR, Gobbi P, Orsini G, Ruggeri A. Immunohistochemical identification of MMP-2 and MMP-9 in human dentin: Correlative FEI-SEM/TEM analysis. J Biomed Mater Res A 2009;88A:697-703. Mazzoni A, Papa V, Nato F, Carrilho M, Tjaderhane L, Ruggeri A. Immunohistochemical and bio-chemical assay of MMP-3 in human dentine. J Dent 2011;39:231–7. Bäckman T. Acid-base balance, dentinogenesis and dental caries. Experimental studies in rats. Academic dissertation presented with the assent of the Faculty of Medicine, University of Oulu, for public discussion in auditorium 1 of the Institute of Dentistry (aapistie 3), 24 September 1999 at 12 noon. Finland: Institute of Dentistry, University of Oulu; 1999. Jain M, Singh A, Sharma A. Relationship of perceived stress and dental caries among pre university students in Bangalore City. J Clin Diagn Res 2014;8:ZC131-4. Sharma M, Astekar M, Soi S, Manjunatha B, Shetty D, Radhakrishnan R. pH gradient reversal: An emerging hallmark of cancers. Recent patents on anti-cancer. Drug Discov 2015;10:244-58.